"Awesome restaurant-style strawberry topping. 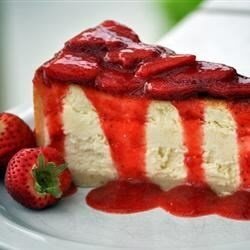 Serve cold over cheesecake or ice cream." Wash strawberries and remove stems; cut large berries in half or roughly chop them. Combine strawberries, sugar, and vanilla in a saucepan. Cook over medium-high heat, stirring occasionally. The mixture will sizzle for a while, but then juice will begin to form. Continue stirring; mash a few strawberries with a wooden spoon or heat-proof spatula to help produce the syrup. Cook until sauce thickens, about 15 minutes. Remove from heat. In a blender, puree about 1/3 of the sauce, then mix back into remaining topping. Store in refrigerator. Decide for yourself how much topping you want. For each additional pint of strawberries, add 1 teaspoon of vanilla extract and 1/3 cup of sugar.